When you hear of a mountain bike, what comes in your mind is an expensive bike that will cost you thousands of bucks. Would you believe me if I told you can get a quality mountain bike under $1000? If you are an enthusiastic rider, you will definitely fall in love with the Diamondback Bicycles Sorrento Hard Tail Complete Mountain Bike. This is a quality bike with a robust construction that will take you to places. Of course, you know the benefits that are associated with riding. It is one of the greatest activities that engage the upper and lower body parts. This Sorrento bike is comfortable to ride, and you will love everything else about this bike. Many people worry about the frame size when purchasing a cheap mountain bike. Will the bike accommodate the height and weight of different individuals? You can end up getting the right bike with the best features only to realize that the frame is very small. Luckily, this bike offers you with multiple frame sizes to suit your height and weight. This makes it very easy for people with different body sizes to ride comfortably on the bike. You can find the frame in 22, 20, 18 and 16 inch options. When you are looking for the best hardtail mountain bikes on the market, you want a bike with strong brakes. This makes it easy to stop instantly when you meet an obstacle ahead without falling over. 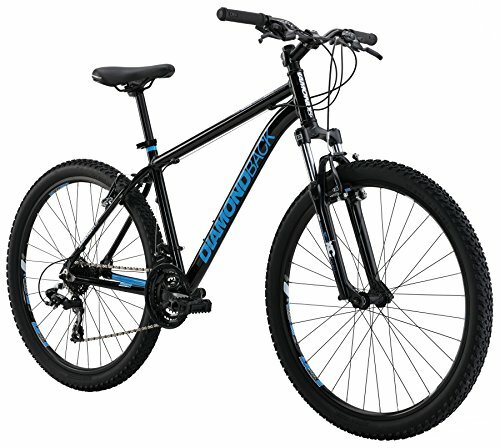 For this reason, Diamondback Bicycle Sorrento has ensured that the brakes of this bike are very powerful. With this, you can travel confidently in different terrains even at high speed without worrying of falling over. Durability is a key thing when it comes to buying the best mountain bike. After all, who wants a bike that will break down after several months of usage? You want a bicycle that will last for an extended period and one that can handle rough road usage. This model features a solid and durable construction so that it can withstand any riding condition. The frame is made from a durable aluminum alloy which assures you of the longevity of the bike. A great bike like this Sorrento mountain bike should be in a position to take to places. It is designed for adventurous riders who are looking forward to riding on rocks, crevices and rough roads without fear. The smooth suspension bike fork of this bike ensures that you can ride on any surface with ease without experiencing problems with your back. The rims are made of strong rims, which provide stability and a comfortable ride. When the rims are combined with the 26-inch wheels, the bike can handle any terrain that you are riding on. You will also enjoy the shifters which allow you to get over any obstacle that comes your way. When you are looking for an entry level mountain bike, quality, durability, ease of use and comfort are some of the things that many people pay attention to. The good thing is that this Diamondback Sorrento bike meets all those requirements. For such an affordable bike price, this bike will be a great purchase. You can ride on any surface without worrying about the bike getting damaged. So, get this bike and make riding one of the most exciting outdoor activities.